At the same time that Brooklyn residents poured into the streets over the killing of Kimani Gray, NYPD officers took the stand to describe the department's racist tactics. On Saturday, March 23, sixteen year-old Kimani Gray was buried in Cypress Hills Cemetery in Brooklyn, surrounded by family and friends. Gray had been killed two weeks earlier by a pair of plainclothes New York City police officers, who shot him seven times on an East Flatbush sidewalk. The officers claim the teenager pointed a gun at them, but witnesses, along with family and friends, vehemently dispute the NYPD's narrative. In the days before Gray’s funeral, hundreds of residents filled the street to display their outrage. Dozens were arrested, some as young as thirteen. As mourners prepared to lower the teen's metallic-blue casket into the ground, a young man in a black T-shirt featuring a picture of Gray broke from the crowd and sat in the grass next to a headstone. Resting his elbows on his knees, he lowered his head and began to cry. The day before Gray was buried, civil rights attorneys in lower Manhattan wrapped up their first week of arguments in Floyd v. City of New York, a landmark class action lawsuit accusing the NYPD of violating the constitutional rights of hundreds of thousands of young men of color not unlike Kimani Gray. 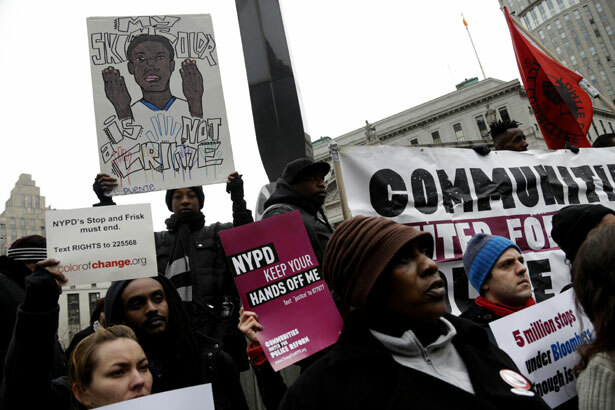 As with the protests following the death of Ramarley Graham in February of 2012— shot in his own home, unarmed, by a plainclothes officer in search of a gun—the anger in the streets was further fueled by deep-seated frustration with the NYPD’s stop-and-frisk program, which overwhelmingly targets young men of color—sometimes leading to brutal and even deadly force. Roughly 4.4 million people have been stopped by the NYPD during the joint tenure of Police Commissioner Ray Kelly and Mayor Michael Bloomberg, according to official government data. Nearly nine out of ten have been released without an arrest or summons. About 86 percent of those stopped have been black or Latino. In 2011, the NYPD's 67th precinct, which patrols the neighborhood where Gray was shot, ranked 16th among other city precincts in overall stops. The 67th came in second, however, when it came to stops that failed to prove wrongdoing: nearly 94 percent of the encounters resulted in no charges. "They do it to a lot of people over here," said Kelly Fraser, 19, who told The Nation that Gray was like “a little brother” to her. "They always messing with you for no reason." Lawyers for the plaintiffs in the Floyd trial hope to prove that stopping people "for no reason" is part of department-wide NYPD practice that is in violation of both the 4th and 14th amendment. The trial began in two packed courtrooms, one where the actual proceedings are taking place for the next several weeks, and another where an overflow of New York City residents, activists, politicians and local attorneys crowded onto courtroom benches, surrounding chairs and open spaces on the floor. They watched intently as the opening statements unfolded via a live feed. "This case is about much more than numbers," Darius Charney, an attorney with the Center for Constitutional Rights, which is representing the plaintiffs said. "It's about people." "There is a wide gap between what the New York Police Department's stop-and-frisk-related policies and procedures say on paper and how they actually operate in practice in the precincts and on the streets of New York City," he added. The NYPD's authority to stop, question and, if needed, search individuals is not being challenged. Instead, attorneys for the plaintiffs hope to convince Judge Shira Scheindlin to reign in a police practice that has resulted in millions of stops, many of which were unconstitutional. The case turns not only on the testimony of the plaintiffs, but also on allegations and recordings made by active NYPD officers who claim that they are forced to abide by a rigidly-enforced quota system. While the vast majority of NYPD stops do not end as tragically as that of Kimani Gray, an untold number provoke feelings of degradation and humiliation. Nicholas Peart, a plaintiff in the Floyd suit, is a 24 year-old African American public housing resident who took custody of his 12 and 13 year-old brothers, as well as his 20 year-old disabled sister, when his mother died of cancer two years ago. He works for a Harlem-based leadership program for youth. Peart says he has been stopped by police at least five times without cause. The first stop took place at gunpoint, he says, on his 18th birthday. It was August 5, 2006 and Peart had traveled to the Upper West Side to celebrate with family. Around 5AM, he was sitting on a bench with a cousin and out of town friend, when they witnessed a car accident. That's when several police cars pulled up. "The officers came out with their guns pointed at us," Peart testified. "They demanded that we get down on the ground." He says he complied in a matter of seconds. A pat-down commenced. "They patted over my basketball shorts and I was touched," Peart testified. When asked to clarify what he meant, Peart struggled for words. "You could feel them touching you in the groin area?" Judge Scheindlin asked. "I was embarrassed,” he went on, “…I felt I didn't belong on 96th Street and Broadway, you know," Peart testified, adding, “I felt criminalized." Following the pat down, Peart was told to stand up. He gave an officer his ID. "Happy birthday," the officer said as he returned it. Three days into the trial lawyers for the plaintiffs shifted focus from the NYPD’s street stops to the internal incentive structure that allegedly motivates them. Active-duty officer Adhyl Polanco testified that the department's stops are the result of a quota system overseen by supervisors. Police stop-and-frisks are recorded on forms known as UF-250s, or simply 250s. Polanco testified that supervisors put a premium on overall numbers of 250s, arrests and summons, with little regard for anything else. "There came a point in time in 2009 where they came very hard with the quotas. They call it productivity." Polanco testified. Every day, he and his fellow officers would return from patrol, report to their platoon commander, “and specifically tell him what we had done for that night." "They will never question the quality," he added. "They will question the quantity…How we got them, they don't really care about." Polanco began secretly recording these meetings at the Bronx's 41st precinct, in the summer of 2009. He told the court he did so because he didn’t think people would believe him otherwise. The recordings, which were played in court, reveal senior officers–including two sergeants, an inspector, a lieutenant and three police union delegates–ordering officers to generate specific numbers in a given month. "They wanted 20 and one," Polanco said. "20 summonses and one arrest per month, per officer, at least." His superiors were “very clear,” he testified. "It's either you do it, it's non-negotiable, or you're going to become a Pizza Hut delivery man." Polanco said the punishments for falling short of quotas ranged from losing a longtime partner, low evaluation scores, retraining and denial of days off or overtime requests. "They can make your life very miserable," he said. In some cases, officers who failed to meet their supervisors' expectations would be called to a scene where a young man would be in handcuffs against a wall, he said. The officer would then be ordered to "either issue the summons, issue the 250, or even arrest the person." Polanco testified that in 2009 he was asked more than twenty times to write a 250 attesting to an incident he did not observe. He also said that officers with low numbers might be forced to have superiors accompany them on their rounds–a practice known as "driving the sergeant" or "driving a supervisor." Superior officers would “tell you to go 250 this guy, go summons this guy, go arrest this guy. You have absolutely no discretion." "We were handcuffing kids for no reason," Polanco testified, adding that "any group of black kids or Hispanic kids” was fair game. "Sometimes they will ask me to summons them. We will ask the supervisor why. And they will say unlawful assembly or something like that." Testimony from another Bronx police officer, Pedro Serrano, 43, represented the first time he was speaking out publicly. Currently a patrol officer at the NYPD's 40th precinct, which in 2011 recorded the highest number of stops in the borough, Serrano repeated Polanco's claim that supervisors expected officers make one arrest and issue 20 summonses per month. Like Polanco, Serrano began recording roll call meetings, as well as conversations with his supervisors. In one recording played before the court, a voice belonging to his precinct’s integrity control officer, according to Serrano, is heard using the phrase, "looking for five,” referring to summonses. The phrase "five, five and five" was heard in another recording played for the court. This time the man was identified as a lieutenant. Serrano testified that failing to meet the precinct’s quotas translated in low evaluation marks. From 2010 to 2011, his scores dropped in every evaluation category. In 2012, he recorded more arrests and summonses, he testified, but his evaluations stayed the same because he performed only two stop-and-frisks for the entire year. His supervisor, Captain Martine Materasso, explained that half of his score was based on “arrests, 250s, and the summonses,” Serrano testified, adding that he “immediately responded that that was a quota and that it wasn't written anywhere." Materasso leaned back in her chair, smiled and responded, "I can do that." Attorneys for the plaintiffs displayed NYPD Operations Order 52, used by Materasso to justify Serrano’s grade. "Department managers can and must set performance goals," it read. Asked how he interpreted the order, Serrano said, "It says 'Quota, quota, quota, quota and quota.'" In a different conversation recorded by Serrano, Deputy Inspector Christopher McCormack told him that robberties in the precinct were on the rise, adding "We're still one of the most violent commands in the city." McCormack told Serrano that in such a violent neighborhood, carrying out just two 250s in a year was “not fair to the public.” Officers must zero in on "the right people, at the right time, at the right location," McCormack added. "What am I supposed to do?” Serrano eventually asked his commanding officer. “Is it stop every black and Hispanic?" After more back and forth, McCormick told him, "I told you at roll call, and I have no problem telling you this, male blacks 14 to 20, 21." For Serrano, a Latino father of four, the idea of targeting individuals based on their age, race and geographic location does not sit well. "It's very simple,” he testified. “I have children. I try to be a decent person," he said. Serrano then began to choke up on the witness stand. Fighting back tears, the officer paused. "As a Hispanic, walking around in the Bronx, I have been stopped many times," Serrano said. "It's not a good feeling. I promised as an officer I would respect everyone to my abilities. I just want to do the right thing. That's all." Two days after Serrano’s testimony—and the day after Kimani Gray’s funeral—activists visited the East Flatbush home where Gray was shot. They chanted at police who were present, shared a moment of silence and eventually moved on to demonstrate at the 67th precinct. Across the street, a half dozen teenage African American boys, dressed in hooded sweatshirts and low-slung pants, looked on. As the protesters prepared to leave, a black car with two men in the front seats pulled forward. The vehicle stopped in front of the group. A white man with short hair sitting in the front passenger seat noticed one of the boys. Gesturing at one of the teenagers, the man smiled and said "Hey." "Hey," a 19-year-old who asked to be identified as Brad replied. While they exchanged pleasantries it was clear their relationship was not rooted in friendship. "I'll see you later," the man in the car said, pointing and smiling as the vehicle pulled away. As the car drove off, Brad put his hand to his head like a telephone. "Call me," he said sarcastically. The men were plainclothes police officers, Brad and his friends said. If a reporter had not been present or if at had been at night, they said the officers may have gotten out of the car. "At night they would've jumped out on us," one of the teens said. His friend agreed, "At night they do everything."